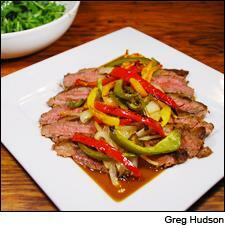 Flank steak is both economical and flavorful; a coffee sauce gives an extra layer of depth to this dish. With fall well underway, I’ve been craving deeper, spicier flavors. A steak dinner seemed in order. Bold flavor, however, doesn’t have to equal heavy or complicated. For this dish, I made a coffee sauce to add an extra level of richness to the steak, but kept the rest of the dish minimalist by pairing it with roasted peppers and onions. Served with a green salad on the side, the result was an easy crowd-pleaser. As a bonus, if you have any leftovers, serve them with tortillas, avocado slices and other fixings for a taco night. I chose to use flank steak for this recipe because it’s both economical and flavorful—always a winning combination. However, since the steak is simply grilled, several other cuts could easily be swapped in, if you prefer another or it's more readily available. Coffee makes a great flavor complement for seared meat—and putting it in a sauce or a marinade is a fantastic way to use up the leftovers at the bottom of a pot. To minimize preparation time, chop the peppers and onions into strips; on particularly harried nights, buying pre-chopped vegetables at the supermarket brings the prep time to almost nothing. Roasting the peppers and onions gives them a sweet, smoky flavor that complements the sauce and the steak's char. I often like to play alchemist by mixing a cadre of spices for a dish—a pinch of this, a dash of that. For simplicity's sake, this time I purchased one chipotle BBQ spice mix, comprising many of the flavors I’d imagined mixing together myself, and used it as a unifying thread throughout all three components of the dish. The result was less time spent mixing and cleaning up. When it came to wine pairing, my mind immediately went to South America. Argentina and Chile make lots of boldly flavored red wines, and value versions that pack a lot of bang for the buck are easy to come by. Both cuisines—and Argentina’s in particular—are well known for their focus on grilled meats. These seemed like natural places to look for a match. I sampled three reds from these two countries against this dish—a Malbec and a Cabernet Sauvignon from Argentina, and a Carmenère-Cabernet blend from Chile. None of these made for a bad match; however, this particular Carmenère-Cabernet blend hit a slightly discordant note with the flavors in the dish. The competition between the other two was extremely close. The steak and sauce emphasized intense coffee notes in the rich, spicy Cabernet Sauvignon, whose complexity shone through. The only downside was that the lightly caramelized, sweet onions brought out a hint of bitterness in the wine. This could very well have been the winner if I’d opted for yellow onions. The Malbec made a lovely pairing with the dish, without further fine-tuning needed. It also had nice degree of spice, and its juicy red fruit fared better against the sweet onions and enhanced the juiciness of steak, making for a seamless interplay between the dish and the wine. 2. Sprinkle salt, spice mix and a small drizzle of oil over the beef. Rub the seasoning into the beef to coat well. Set aside to infuse flavor for 10 to 30 minutes. 3. Toss the peppers and onions lightly with oil, spice mix and salt. Lightly grease a roasting pan or baking sheet. Spread out the onions and peppers in a single layer, then place the pan in the oven. Toss after 10 minutes. Roast until the vegetables have begun to brown lightly, about 15 to 20 minutes. 4. Melt the butter in a saucepan, then add in the flour to create a roux. Whisk until the flour is fully absorbed and the mixture forms a paste. Add the coffee and beef stock. Bring the mixture to a boil and reduce heat to a simmer. Season with salt and spice mix. Allow the sauce to continue to reduce and thicken while preparing the steak. 5. Heat a lightly greased cast-iron skillet or grill pan over medium-high heat. Once the pan is really hot, add the flank steak. Grill steak on each side until the meat reaches an internal temperature of about 135° F for medium-rare, about 4 to 5 minutes per side, depending on the thickness of the cut. (Cook longer for well done.) Remove the steak from the heat and tent with aluminum foil. Allow the steak to rest for 5 to 10 minutes. 6. Deglaze the pan by adding a small amount of cooking liquid (any leftover coffee or stock, or even a little bit of water) and scraping up any brown bits with a spoon. Add the drippings to the coffee sauce and stir to incorporate. Taste the sauce and adjust seasoning. If the sauce is too bitter, add a small amount of sugar (between 1 teaspoon to 1 tablespoon, to taste). This will smooth out and balance the flavor. The sauce is ready once the sauce is thick enough to coat the back of a spoon. Optional: For an extra-smooth sauce, pass it through a strainer. 7. Once the steak has finished resting, slice against the grain and on a bias into thin strips. 8. Remove the peppers and onions from the oven. Taste and adjust seasoning. 9. To plate, pour a small amount of sauce onto the base of a platter, arrange the strips of steak on the sauce, and mound the roasted peppers and onions on top. Serve with extra sauce on the side. Serves 4.